Founded in 1852, the old mining town of Jacksonville, Oregon prides itself on keeping its city structures historically accurate. So, it was welcome news when the town’s Historic Architectural Review Committee approved a DaVinci Roofscapes polymer shake roof to replace the decaying cedar shake shingles on the roof at the historic First Presbyterian Church of Jacksonville, which opened in 1881. 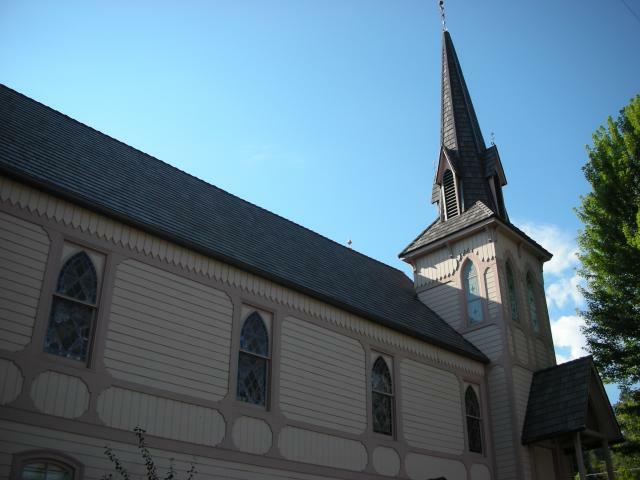 The DaVinci Shake roofing products chosen for the First Presbyterian Church of Jacksonville are Class 4 impact rated and has a Class A fire rating. The roofing materials have also achieved the highest ratings for straight line wind testing at 110 mph and have passed testing for extreme weather conditions. A Tahoe blend featuring five shades of brown in multi-width roofing tiles provides the church with the authentic cedar look they desired in a fake cedar shake shingle. For more information on churches with DaVinci roofs visit Churches Thankful for Roofs Overhead.